Under the current European Union frameworks for dealing with banking problems, resolution of banks is seen as an exception to be activated only if liquidation under national insolvency proceedings would not be warranted. This is most notably the case when the bank provides critical functions to the economy, or when its liquidation might threaten financial stability. The two options – resolution and liquidation – differ substantially when it comes to the scope of legislation that is applicable to the use of public funds. The EU Bank Recovery and Resolution Directive (2014/59/EU) covers resolution, while liquidation is regulated by national insolvency laws. The liquidations of Veneto Banca and Banca Popolare di Vicenza in Italy highlight how this two-tier framework raises important questions in the context of EU banking union. The first question is whether the definitions of critical functions and public interest – key elements in the context of liquidation – should be clarified. A second question is whether the current legal and regulatory situation within banking union ensures that similar banks can expect predictable equal treatment in case of failure. 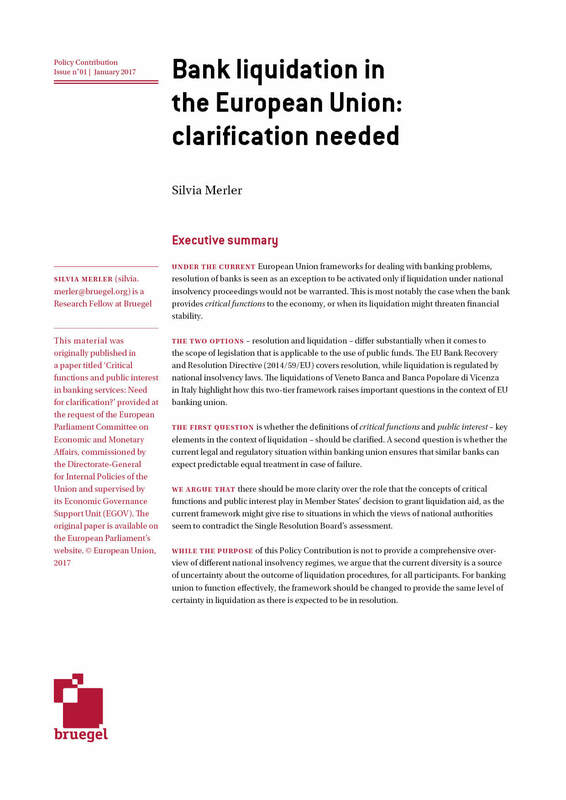 The author argues that there should be more clarity over the role that the concepts of critical functions and public interest play in Member States’ decision to grant liquidation aid, as the current framework might give rise to situations in which the views of national authorities seem to contradict the Single Resolution Board’s assessment. While the purpose of this Policy Contribution is not to provide a comprehensive overview of different national insolvency regimes, the author argues that the current diversity is a source of uncertainty about the outcome of liquidation procedures, for all participants. For banking union to function effectively, the framework should be changed to provide the same level of certainty in liquidation as there is expected to be in resolution.